Love the outdoors? This heavy-duty stainless steel mug from Real Deal Steel is a camp cup in a class by itself. It will be a staple in your gear for years to come due to its rugged, no nonsense construction. All Real Deal Steel mugs are made from 18/8 304 stainless steel from top to bottom, inside and out. Why is that so important? Aside from not rusting or easily tarnishing, there is no unpleasant taste or risk of them leaching chemicals or gases when holding hot beverages. Our mugs are healthier for you, perform great and look pretty darn cool - what else could you ask for? This heavy duty mug features our thickest gauge yet. There is nothing like a hot cup of coffee or tea to start your day or give you a nice pick me up in the afternoon. With our mug's double-walled construction, you can now sip and savor your favorite drink for longer! It does not matter if it is hot or cold, either - the steel walls insulate your beverage to keep it the perfect temperature while also preventing the outside of the mug from sweating or feeling too hot to the touch. You will not burn your hand or have to drink lukewarm coffee again! A common problem with mugs, especially ceramic, is their durability. They can easily crack, chip or lose a handle while being washed or used. 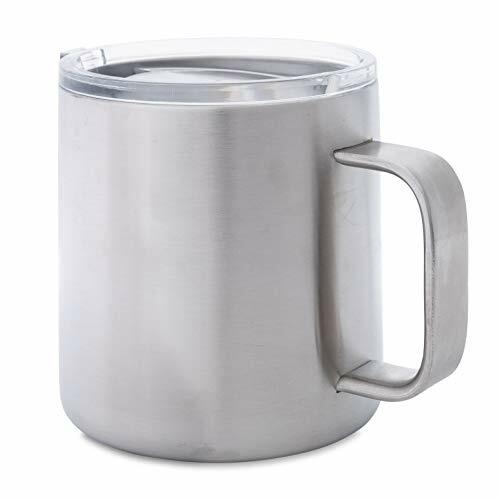 Our stainless steel mugs are much stronger and made with a welded metal handle that is not going anywhere. These coffee cups will have no trouble handling daily use and some extra abuse. The soft edges and subtle grooves for the fingers and thumb make this mug a pleasure to hold. The 16 ounce mug is the perfect size for individual use and sturdy enough to take on the go, whether it is to your office or a faraway campsite. Pick up a Real Deal Steel heavy duty mug for yourself or give it as a gift to any person that loves the outdoors. HIGHEST QUALITY THICK GAUGE STEEL: All Real Deal Steel stainless steel mugs are made from 100% food grade 18/8. This mug features thick gauge steel. The weight of this bad boy comes in at a whopping 335 grams, not including the lid. DOUBLE WALL VACUUM INSULATION: Sip and savor your hot or cold drink longer courtesy of our cup's double wall construction; it keeps your beverage the perfect temperature and also prevents condensation. WELDED HANDLE: The smooth, easy to grip rectangular handle is welded onto the cup for extra strength instead of being epoxied or screwed like other mugs; Because there is plenty of mass to weld, it will never break off. Unlike competitors, it is engineered with subtle grooves on the underside for increased comfort. SNUG FIT LID: This plastic lid has a very tight seal to give you confidence it will not leak. It comes equipped with an easy to use slider. Unlike other lids, the slider is both on the top and bottom of the lid, so it is very leak resistant. THE ULTIMATE CAMPING CUP: As far as camping mugs go, this is the most deluxe you will find. This cup is a perfect companion for picnics, backpacking, boating and other outdoor activities. Great for coffee, tea, cocktails, shakes, floats, smoothies. Plus the wide mouth makes it an excellent choice for cereal or soup. This particular camping mug is also ideal for enjoying beer or cocktails. If you have any questions about this product by Real Deal Steel, contact us by completing and submitting the form below. If you are looking for a specif part number, please include it with your message.